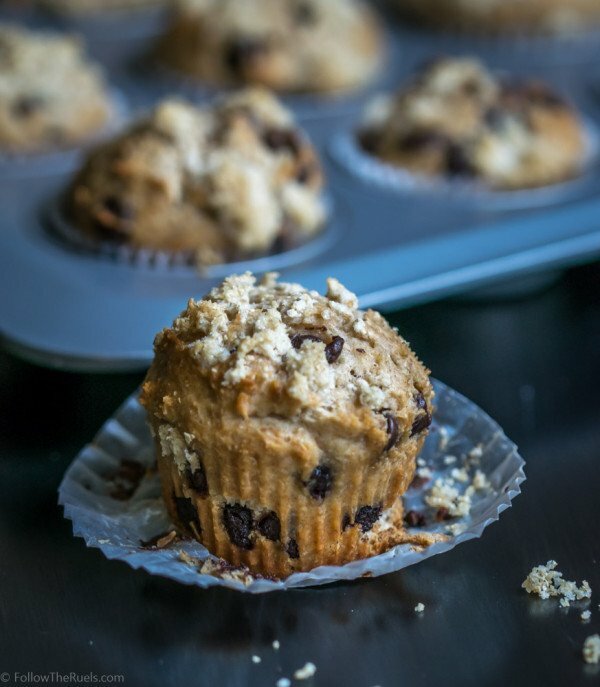 It's been a while since I've posted a muffin recipe, hasn't it? I was all about muffins back in the day. It is definitely one of my favorite breakfast food items to make because you get so much bang for your buck. Make one easy batter, fill it with what you want, and you end up with a dozen delicious muffins. Whenever I have to bring a breakfast food for a large group, I make muffins. Which is exactly how these came about! For Sunday School this past week, I volunteered to bring breakfast. I wanted something crowd-pleasing, but also a bit healthy. So I balanced the chocolate chips with whole wheat and bran flour in the muffin. Life is all about balance, right? I started with my basic muffin batter. I replaced some of the all purpose flour with whole wheat, and added in a touch of bran. Just a touch, because bran flour can throw off the texture of these whole wheat muffins. But for some extra crunch on top, I mixed together a little strussel topping with bran flour, sugar, and butter. I crumbled that on top and let it bake until golden brown. These definitely have a bit of a bran, whole wheat flavor. But the chocolate chips add enough sweetness to make you forget you are eating something mildly healthy. If you don't like the flavor of whole wheat, just reduce the amount by half and replace with AP flour. It will be diluted enough that you will barely taste it, but still get some of the benefit of the whole wheat. Preheat the oven to 400 degrees and prepare 1 regular muffin tin. In a large bowl, mix together flours, sugar, salt, and baking powder. In a small bowl or large liquid measuring cup, whisk together milk, yogurt, butter, egg, and vanilla. Pour the liquid ingredients into the dry ingredients, and mix until dry ingredients are just incorporated. Fold in the chocolate chips. Scoop 1/4 - 1/3 cup of batter into each tin. Bake for 20 to 25 minutes, or until a knife comes out clean.